I lived my adult life with bags under my eyes and never thought I could do a thing about it. I'm the Chief Financial Officer at Sheer Science, it's a busy, young office, so I've got to look my best. It's amazing that Plexaderm actually works. In 10 minutes, the skin around my eyes transforms and it really looks great. Mike's under-eye bags visibly disappeared in 10 min. The Below Images Have Not Been Altered in Any Way! All after images taken within 10 minutes! 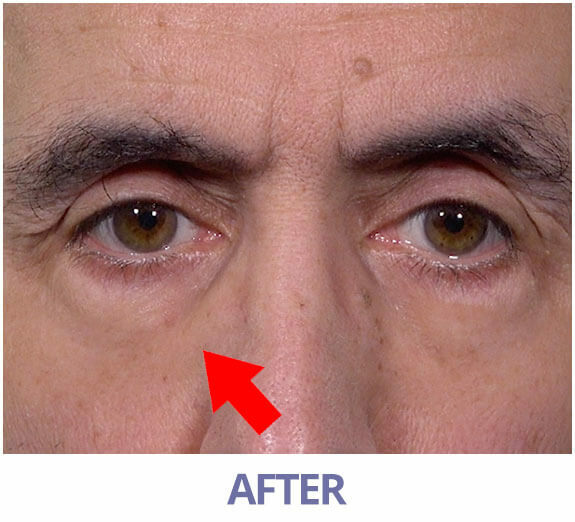 Ritchie experienced a Significant reduction in the appearance of his under-eye bags as well a smoothing effect on the texture of his skin. Mona experienced a great effect on minimizing the appearance of crow’s feet, as well as visibly smoothing the skin surrounding her eyes. We tested a group of 43 people. Results Based on Scientific Measurements using VISIA® Complexion Analysis System. 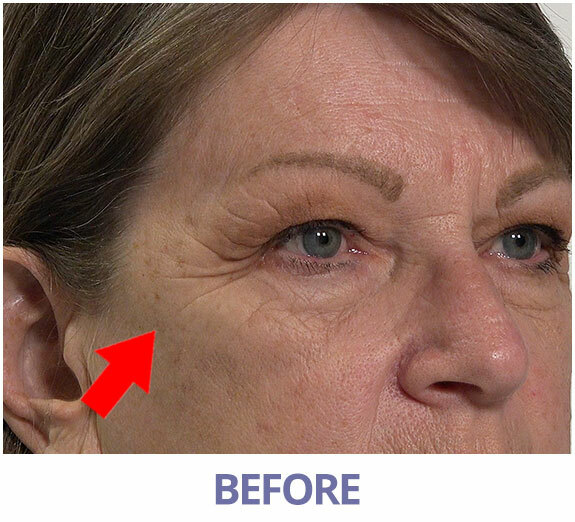 The study is intended to provide absolute proof that Plexaderm works to reduce lines, wrinkles, and bags under and around the eyes in 10 minutes. This study was performed between January and February 2019 in Florida. 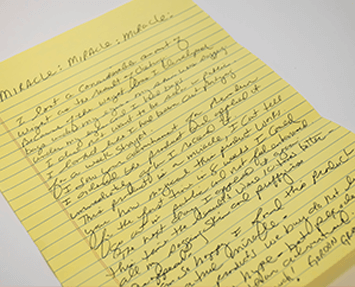 Each subject was required to sign a written informed consent, which explained the type of study, the procedures to be followed, the general nature of the materials being tested, and any known or anticipated adverse reactions that might result from participation. 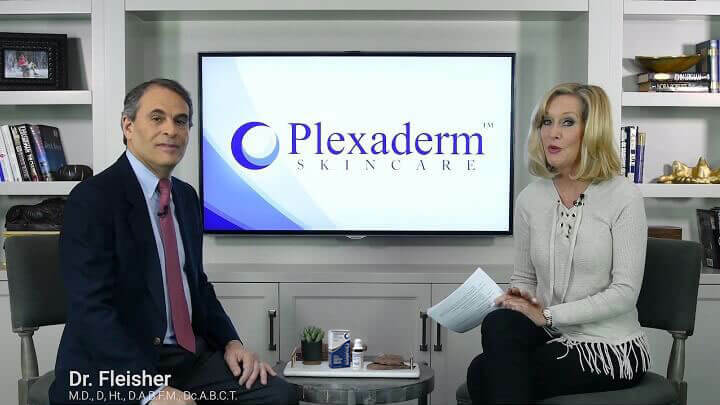 Dr. Mitchell Fleisher discusses the incredible clinical trial results, and scientific technology behind under-eye & wrinkle serum Plexaderm Rapid Reduction Serum. 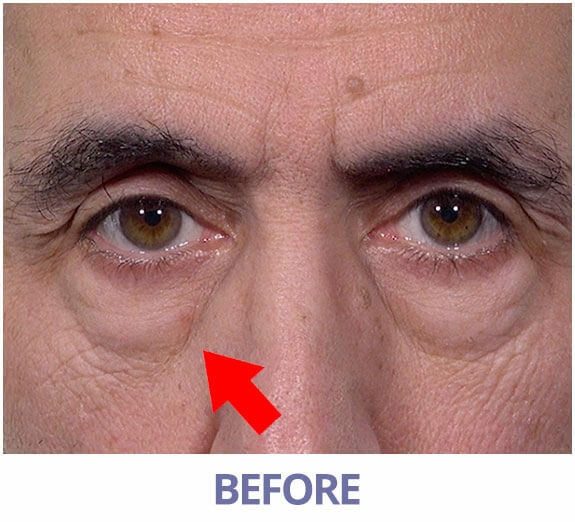 He also explains how men and women differ as they age, and how Plexaderm reduces the visible signs of wrinkles, under-eye bags and aging for both sexes. Plexaderm was celebrated as Gold winner for BEST NEW PRODUCT in the 10th Annual 2018 Golden Bridge Awards. Best in Biz Awards honored Plexaderm as Silver winner for MOST INNOVATIVE PRODUCT OF THE YEAR 2018. All of the Plexaderm offers below are for a One-Time purchase with NO future commitment AND every order comes with our 30-Day Hassle-Free Money Back Guarantee! If you’re not happy with your products for ANY reason, simply send them back to us within 30 days for a full refund less the cost of shipping and processing. Click here for details. NO automatic shipments! NO fine print! NO frustrations! Plexaderm smooths fine lines and firms skin, redefines facial contours, improves skin density, refines skin texture and minimizes visible pore size. Each application of Plexaderm typically lasts for hours or until it's washed off. 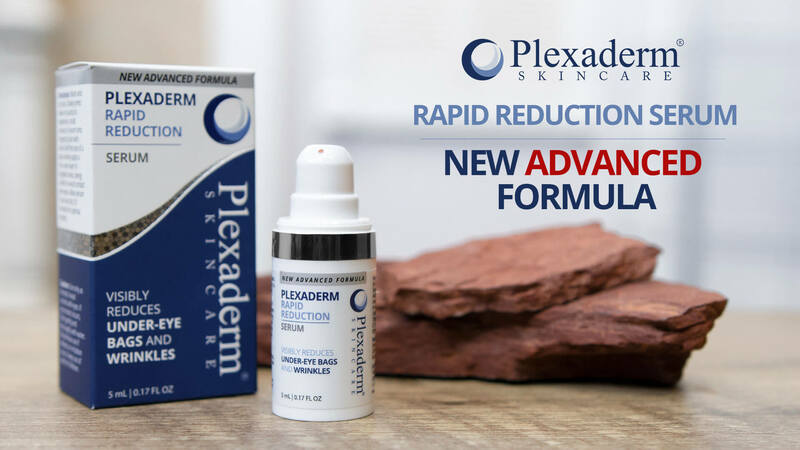 Try a 30-day supply of Plexaderm® Rapid Reduction Serum for just $59.95 plus FREE shipping and processing. You will receive one 5ml bottle with this purchase. One-time purchase. No automatic shipments! Length of supply reflects daily application surrounding both eyes. Save even more by upgrading to our buy 2 get 1 free special (a 3-month supply) for just $119.90 plus FREE shipping and processing. That’s over 66% in savings each month compared to the normal single bottle price. 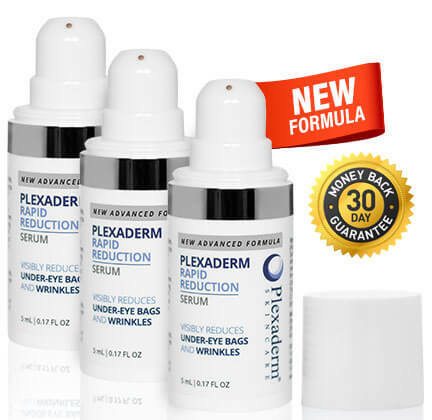 You will receive Three 5ml bottles of Plexaderm® Rapid Reduction Serum. One-time purchase. No automatic shipments! Length of supply reflects daily application surrounding both eyes. I lost a considerable amount of weight as the result of dieting. Because of the weight loss I developed bags under my eyes. My skin was sagging under my eyes and I had bags. I did not want to be seen in public. I looked like I had been out partying for a week straight. I saw your advertisement for Plexaderm. I ordered the product and applied it immediately after I received it. This product is a miracle, I can't tell you how magical this product works. For the first time in 8 weeks I could go out in public and not feel embarrassed. All my sagging skin and puffiness disappeared. I am so happy I found this product. It is a true miracle. So many products we buy do not live up to the hype. But Plexaderm is even better than advertised. I've seen an ad on T.V. I've seen an ad on T.V. showing a male model applying Plexaderm under his eyes to remove bags. Since I have horrible bags that are due to hereditary and age (I’m 54) I thought maybe I would try it before I make an appointment for injections. Then i thought ... no this is just another gimmick. Well after about 2 weeks of constantly seeing the ad for Plexaderm, I thought I don't have anything to lose since it's a Money Back Guarantee... So, I ordered a bottle. I must admit it took me a couple of days to even open the box since I already prepared myself to be disappointed. Well was I wrong! I love this ... I have to use Plexaderm every day. I couldn't believe how it diminished my bags and no wrinkles! It makes me look so refreshed and wide awake. The first time I used it my Mom said, "looks like you got a good night's sleep" ... (I wasn't going to share my secret but I did) Now she is ordering a bottle. I find after I apply a small amount of Pleaxaderm under my eyes I tilt my head back slightly and use my hairdryer to speed up the drying time. (It takes less than a minute). I am so glad i decided to try Plexaderm ... it truly lives up to its promise. 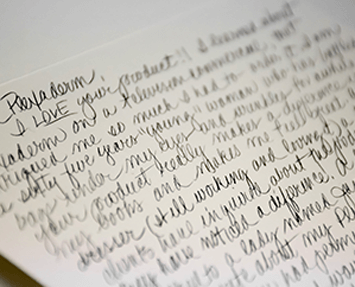 I LOVE your product!! I learned about Plexaderm on a television commercial, that intrigued me so much i had to order it. I am sixty five years "young" woman who has battled bags under my eyes and wrinkles for a while now. Your product really makes a difference in my looks and makes me feel great. 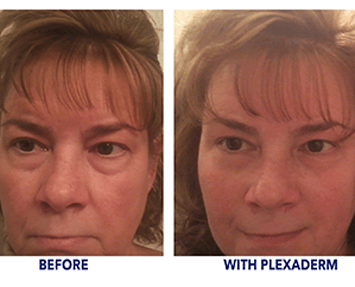 Didn’t see the results you expected from Plexaderm? 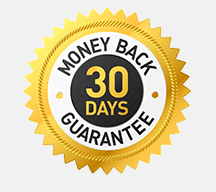 You’re covered by our 30 day money back guarantee. If you are unhappy with your purchase, please return merchandise and receive a full product refund for your order less any shipping and processing. Plexaderm is easy and simple to use. Slowly press down on pump to dispense a small amount of serum onto fingertip (start with about half the size of a pea). Gently apply a thin, even layer to targeted areas, being careful to avoid contact with eyes. Allow Plexaderm to set and dry (10 minutes for optimal results). 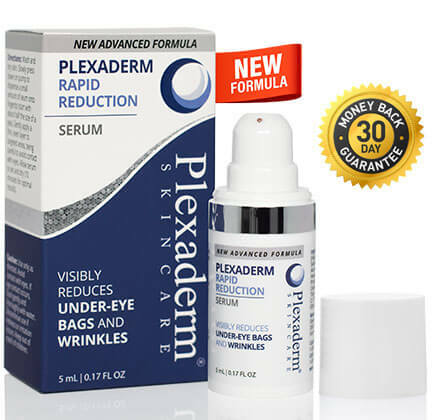 Can I wear makeup with Plexaderm® Rapid Reduction Serum? Yes you can! However, to maintain maximum results we do suggest using dry or powdered makeup anywhere you have applied the Rapid Reduction Serum. 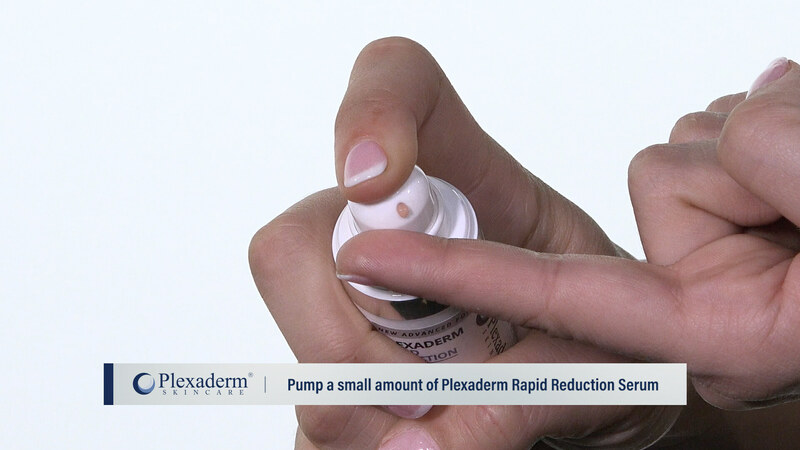 Can I use moisturizer while using Plexaderm® Rapid Reduction Serum? If you need to apply a moisturizer on the areas that you use Plexaderm, wait at least 15 minutes after application of the moisturizer before applying Plexaderm. 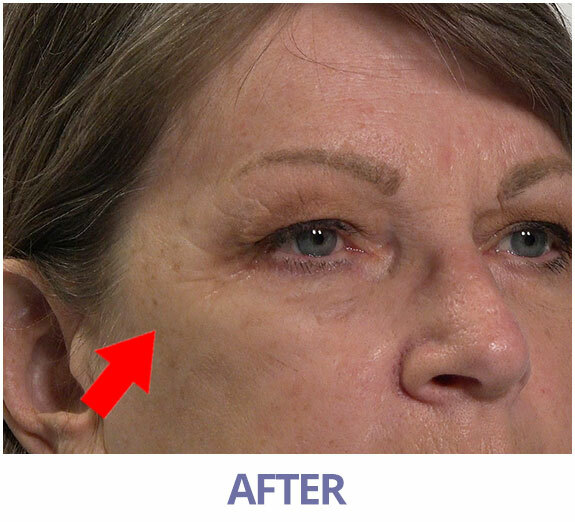 A second application of Plexaderm may be required if you don’t see the desired results. Oil moisturizers usually have a greater deactivating effect on Plexaderm. How long does Plexaderms effect last? Plexaderm lasts for hours or until you wash it off at the end of the day. Extreme sweat, certain oils and very oily skin will shorten its effects; however, if you apply it to a clean dry face, allow for the proper time to dry and set (5-10 Minutes), you will get effects that lasts for many hours with impressive results. 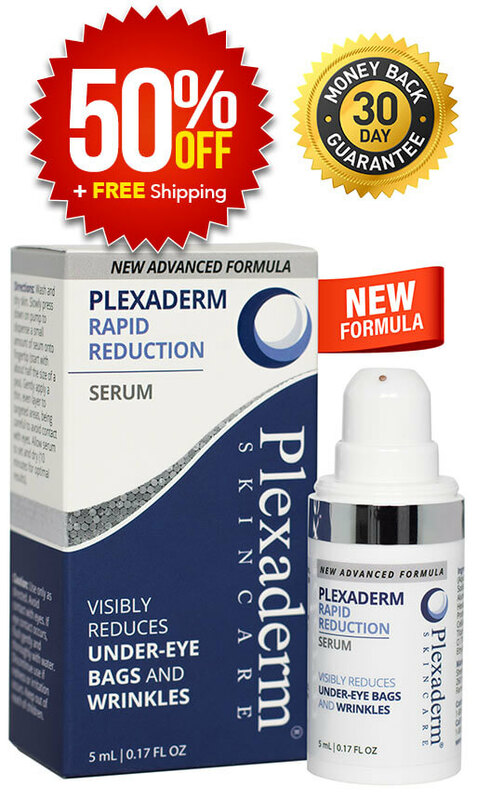 What are the Ingredients of Plexaderm Rapid Reduction Serum? Purified Water (Aqua), Propylene Glycol, Sodium Silicate, Magnesium Aluminum Silicate, Acetyl Hexapeptide-8, Hydrolyzed Rice Protein, Soluble Collagen, Cellulose Gum, Xanthan Gum, Titanium Dioxide, CI 77491, CI 77492, Phenoxyethanol, Ethylhexylglycerin. What if I apply too much Plexaderm® Rapid Reduction Serum onto my skin? You can remove excess Plexaderm® by using a damp washcloth, and dabbing gently onto the affected areas. Results vary by individual, but you can expect to see a significant difference in the texture, tone and appearance of your skin after just one use of the Rapid Reduction Serum! I want rapid results — Can I use a blow dryer to accelerate the drying process? Yes! Once Plexaderm® is applied, use a blow dryer on the lowest temperature setting. Where can I purchase the other Plexaderm Products? Additional Plexaderm products can be purchased by contacting our sales department at (800) 673-2201 or by visiting www.sheerscience.com. Why do under-eye bags develop? As we age, the tissue and skin that holds in fat below our eyes can weaken. When the tissue weakens, fat can push forward giving you unsightly bags below your eyes. What can make it look even worse is that fat can cast a shadow from light above, making you look tired, older and just worn out. Does Plexaderm have any side effects? Plexaderm has been used by thousands of people without any significant side effects. If you experience a reaction of any type, please call customer service and let us know. Copyright © 2019 Plexaderm. All rights reserved. design by Sheer Science.